Sometimes I’ve wondered how I would function if I had to share living space with someone allergic to peanuts. My peanut butter addiction just might force me to move out. I can’t imagine not being able to have a PB&J for lunch or, say, these Peanut Butter Crisscrosses for a treat. Peanut butter cookies are one of those childhood things that I’ve never tired of (one of many, I will admit!). These ones are soft and chewy, as a good peanut butter cookie should be, and the sugar sprinkled on top gives them just the right amount of crunch. The recipe was pretty clear about not using natural PB here, but that was what I had, so that was what I used. To make it a little more like the kiddie brands, I put in a squeeze of golden syrup. I also swapped a little AP with a little whole wheat flour. I don’t think anyone would be able to call me out on either of these changes. For the recipe, see Baking: From My Home to Yours by Dorie Greenspan, or read Jasmine Cuisine, as it was Jasmine’s choice for TWD this week. Don’t forget to check out the TWD Blogroll! haha! i didn’t know what to call it either! Yum! These look exactly like the peanut butter cookies I grew up with. Perfect. Love the gorgeous colour on your cookies. And these were good, I have to say. Smart idea to add the golden syrup. I love the visible sugar crystals on your cookies. Did you use coarse sugar? No Trader Joe’s in Canada sadly, but peanut flour sounds interesting. I usually stock up there when I’m in the States. I’m with you on the peanut addiction. My husband puts it in his oatmeal every day, and I eat it with a spoon. And now I have to go check out Trader Joe’s . . . .
I’m with you on the peanut allergy although I do have a friend that is deathly allergic. It must be awful for him. I eat peanut something about 3-5 times a week! I seriously can eat peanut butter out of the jar. Your cookies look so good. I love your cookie, and the fact that it’s on wax paper makes it all the more special. I’m very curious about that flour too! I would have a hard time living in a ‘peanut free’ kitchen. We loved these cookies. Yum. these look great!! I couldn’t live in a peanut free environment either!! no pb&j?! no cookies?? gah, kill me nooow! I always love your photos… so pretty! mmmmmm i wanna sink my teeth into those. they look so good. My version of these is PB and White Chocolate thumprints. Great job this week! I’m SO happy I’m not in school now when everyone in their brother is allergic to peanut butter. I could never live with someone with a serious allergy to it either! These look SO good. Peanut butter cookies are my favorites and these look especially fabulous! Well, whatever you used worked. You’ve got some wonderful looking cookies. Perfect! Perfect! And I’m with Jessica — your photos do always look lovely. i often wonder the same thing myself! pb is a total staple around my apartment. your photo is just lovely! Your cookie looks good with the substitutions. Ciao ! So now I know I have to stock some pb when you come to Roma !!! Lovely dinner you had ! Your cookies look absolutely delicious. 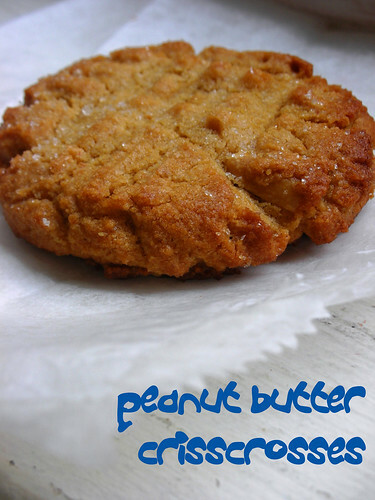 I can not pass up a peanut butter cookie … all time favorite. Your allergy comment made me chuckle. It kills me that I can not send the kids to school with any PB in their lunches. My childhood lunch always had PB cookies, nutter butters or a PB&J. Truly a tragedy! Love your blog. Oh man, a peanut allergy seems like the worst. Especially the bad ones, where you can have a reaction just by being near someone who’s eaten peanut butter…counting my lucky stars I don’t have to deal with that! I wanted to use natural PB but her recipe scared me out of it…glad to know it works okay. What a beautifully browned cookie! I am a peanut butter addict too, and I couldn’t live without it. Thanks for baking with me this week! Love the sparkly tops…I would go a long way for sparkly topped cookies.